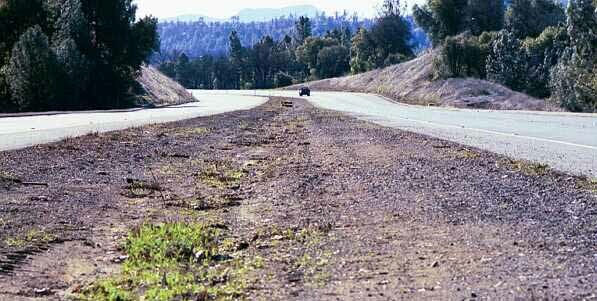 Highway Medians-- too narrow for irrigation systems or maintenance - what about native plants? Shown above is an example of the narrow medians that are faced by maintenance crews all over the State---too narrow to safely maintain either with mowing or spraying, or to maintain an irrigation system for exotics. The suggested alternative in some Districts is to pave medians less than 30 feet wide. What is the cost of paving? Perhaps local native plants could be used as a lower-cost solution? A median 20 feet wide and one mile long costs $200,000 to asphalt. If you could direct-seed California native species, the costs of materials (not including labor) would be about $10,000, only 5 % the cost of asphalting. When you have a median which is as weed-free as in the photo above, it can provide the perfect test-site to conduct trial planting of various local native species. Local native plants, if properly installed, do not require an irrigation system or maintenance. Updated April 28, 2016. Back to Craig Dremann's main Contents page.